Spring will be here in just a few weeks and the gardeners in all of us will be itching to get back outside to tend to our yards and gardens. Some of you might have some projects planned such as clearing brush or cutting down trees but, when venturing into areas with undergrowth it’s important to understand the dangers that can be lurking there. Here in the northeast, there are 3 common types of poisonous plants that can really put a damper on your weekend if you so much as touch them. Poison Ivy is probably the most talked about plant that can cause severe rashes and itchiness when it comes into contact with human skin. The severity of the reaction depends on the person but it’s a good idea to stay away from this plant whenever you see it. You’ve probably heard the old gardening proverb, “Leaves of three, let it be”. This is a vital step in identifying poison ivy. Now, not all three-leaved plants are poison ivy but all poison ivy is three-leaved so if you are unsure, “let it be”. The leaves of poison ivy can range from green to orange or reddish-purple. They can grow low to the ground as a shrub or can climb a tree like a vine. The vines are usually what get unaware homeowners as they try to free their trees of the vines while not wearing any gloves or protective clothes. Red hairs on the stem or vine. Understanding how poison ivy spreads is also very important. 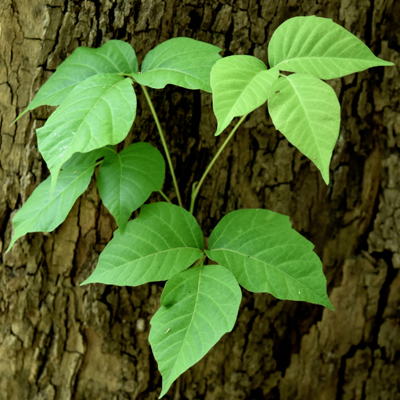 Oftentimes people get poison ivy from a secondary source since the oil can linger around for years. Trees that once had poison ivy on it but now no longer do, can still have oil on it. Pets aren’t affected but they can pass it on to you. If you notice that you have been working in poison ivy it’s vital that you wash your clothes and take a shower immediately. It may be too late but it can prevent you from spreading it to other parts of your body and to others. Poison ivy can remain dormant in the skin for quite a while so just because you don’t see an immediate reaction doesn’t mean you are in the clear. 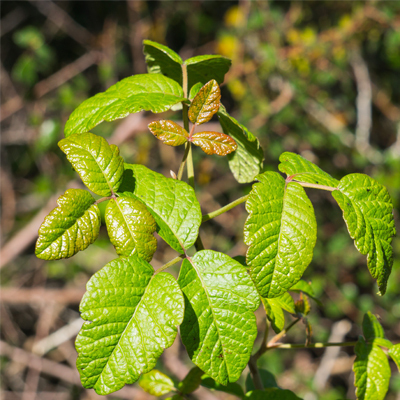 Poison oak is another plant appearing as a shrub or vine that can cause similar reactions to poison ivy. In fact, poison oak is often mistaken for poison ivy but it doesn’t really matter since you should keep far away from both. Almost always has 3 leaves but can have more. The leaves are more notched, resembling an oak leaf. Tiny hairs on both sides (I hope you don’t get that close). As with poison ivy, extreme precautions should be taken when removing this plant. Never remove by hand intentionally, even if you are wearing gloves. Instead, use chemical herbicides and use it generously. This is not a plant you want growing anywhere near your yard. Poison Sumac is not in the same family as poison oak or poison ivy but it can cause similar reactions. Unlike the other two, sumac is usually found in swamps or wet areas and grows as a small tree or shrub that can grow up to 20 feet tall. Poison sumac is a little trickier to identify than poison oak or ivy. Each stem usually has between 7-13 leaves and resembles the leaves of an elm tree. Leaves are smoother than an elm tree and grow on red stems. In the fall poison sumac becomes much easier to spot when the leaves turn red, yellow, and pink and usually produce small yellow berries. Removing poison sumac is not as easy as removing poison ivy or oak since it is a tree with an established root system. The entire tree needs to be dug up and disposed of to ensure it doesn’t grow back, all the while using extreme caution that it does not touch you. That’s why it’s highly recommended to hire a professional for this job. Wear long sleeves, pants, and gloves. Rinse tools with rubbing alcohol and wash all clothes afterward. NEVER EVER, EVER burn poison oak, ivy, or sumac as inhaling the smoke can cause a severe reaction in your throat. That goes for burning wood that once had poison ivy vines crawling on it. Always shower immediately after handling. Allergic reactions typically last 2 to 3 weeks. In severe cases such as widespread reaction or if it’s gotten into your throat seek immediate medical attention. If you identify or even suspect that you have one of these three toxic plants growing in your yard call Naturally Green today. We will send out a trained professional to eliminate the plants with our targeted herbicides. Just call (203) 230-9212 or leave us a message.